One of the most enjoyable parts of practicing origami is experimenting with the many different types of paper that are available. Japanese Chiyogami papers make especially beautiful backdrops for your favorite origami designs. The name Chiyogami is a combination of the words chiyo (one thousand generations) and kami (paper). Chiyogami is sometimes called Yuzen in the United States, in recognition of the area of Japan that is famous for its sophisticated techniques for dyeing cloth and often said to be the source of inspiration for many of the paper designs. Chiyogami is silk-screened and usually created in small, family-run Japanese papermaking studios. Base papers are pasted to a wooden board for stability, and then silk-screened with as many colors as there are in a particular pattern. This is usually either four or five colors for each pattern, with each color requiring its own screen to store. The paper must be dried completely between ink applications, and then the following screen must be precisely aligned to ensure that the pattern is formed correctly. When Chiyogami was first developed during the Endo period, designs were often based on the colorful patterns found on kimonos. Patterns can be classified as geometric motifs, text, or designs found in nature such as plants, butterflies, flowers, and birds. The patterns are generally fairly small in scale and repetitive, similar to what you'd find on a bolt of fabric. Some Chiyogami patterns are created to symbolize specific meanings, which can make them an interesting addition to your paper folding project. For example, Chiyogami papers with cranes in the design indicate wishes for long life. Bamboo symbolizes flexibility, while designs with pine boughs and plum blossoms show intent for beauty and longevity. 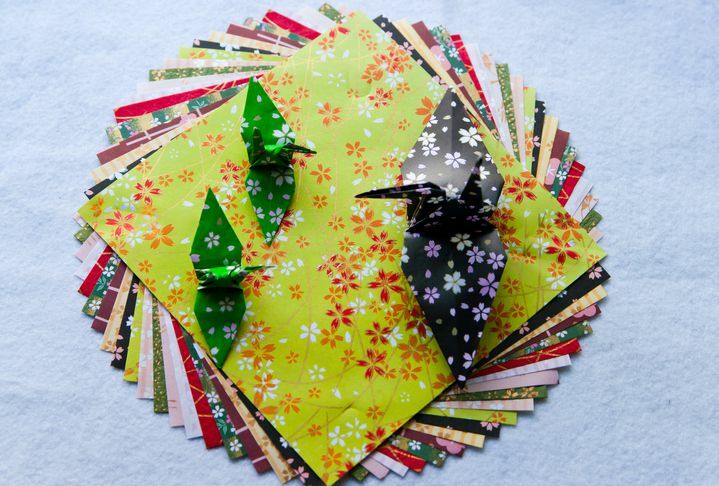 In origami, Chiyogami papers are best used for folding traditional cranes, geometric models, and abstract decorative models. The ink used to print Chiyogami paper can create a thick layer over the base that some people feel makes it more difficult to fold origami models with complex creases. In addition to being used for origami, Chiyogami papers are frequently used in bookmaking and for matting photos or framing as small works of art. They are also suitable for paper crafts such as scrapbooking, card making, decoupage, and iris folding. You can purchase packages of Chiyogami papers from specialty websites such as The Origami Paper Shop. Chain craft stores selling origami paper, such as Hobby Lobby and Michaels Crafts, may also have a small assortment of Chiyogami papers available for you to purchase. The price for purchased Japanese Chiyogami papers will vary according to factors such as the weight of the base paper, the number of colors in the design, and the quality of the pigments that are used for the silk screening process. Authentic Chiyogami papers are distinguished by vibrant colors, pigments that resist fading, and paper that is durable with a high kozo content. Some sheets of Chiyogami paper will also be marked with a paste residue on the back. This is from the papers being pasted on boards when the colors are applied, but it shouldn't interfere with your origami projects. In most cases, Chiyogami paper is viewed as a less expensive alternative to washi paper–a type of Japanese handmade paper often created using fibers from the bark of the gampi tree. This makes it a good choice for crafters on a budget or paper folding enthusiasts who want to try new models without worrying about wasting their more expensive papers. If you're more interested in the pattern of the paper than the process by which it is made, Canon Creative Park offers a collection of 180 elegantly designed Chiyogami graphics that you can print onto the paper of your choice. These Chiyogami origami papers are available as free PDF downloads that can be used as many times as you wish. It is recommended that you use the "high" quality setting on your printer for best results, however. Also, look around your house for other paper ideas.